The Blessed Sacrament is exposed in the church on the first Friday of each month from 8:30am (immediately following the 8:00am Mass) to 12:00 Noon. Individuals who wish to participate in this wonderful devotional practice can sign up for half hour intervals in the narthex of the church a couple days before adoration is schedule or by calling Randy at the Parish Center 608-325-9506 or emailing him at randys@stclaregreencty.org. "Walk - ins" are welcome! The best friend and the love of our souls is Jesus Christ. Yet many of us suffer from a feeling that we don’t really know who Jesus is, or we don’t feel like we have a personal relationship with Him. Jesus is more like a figure from a history book to us, or some mysterious God-man who we know we have obligations to, yet we don’t really feel anything in our hearts towards Him. Eucharistic Adoration is the best way we have on this earth to spend a long time in quiet conversation with Jesus. You’ll recall that just before Jesus physically left the apostles and ascended to the Father, he reassured them, “And behold, I am with you always, until the end of the age.” (Matthew 28:20) This statement is fulfilled in the reality of Jesus’ Real Presence in the Eucharist, in the hands of the priest at Mass each day, reserved in the tabernacles in the heart of our churches, and right before our very eyes in Eucharistic Adoration. 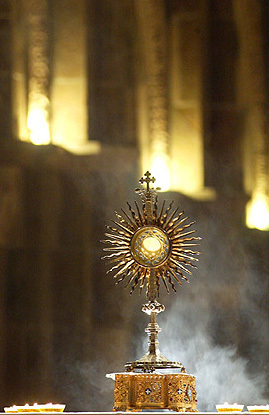 What sets Eucharistic Adoration apart from other forms of prayer is that we are able to be in the same room with Him present in the Blessed Sacrament, the Eucharist. Though veiled under the appearance of bread, in reality we are gazing on His Sacred Heart, and the love that radiates from the little white host in the monstrance (the beautiful stand which holds the host behind glass for the adorer to see) is transforming. Sitting or kneeling in the presence of Jesus in this way could be called “Son-bathing.” Like the rays of sunshine that warm our skin, the rays of His love touch our souls and provide healing, reassurance, comfort, strength… whatever it is we need in this life to help us live according to God’s will so we can one day live with Him forever in Heaven. Get More Out of Mass – Adore the Blessed Sacrament Outside of Mass! St. Augustine said, “No one partakes of this Flesh before he has adored it.” The experience of receiving Communion is so brief. To make the most of that fleeting moment, prepare yourself to receive Him by spending time in Adoration. Adoring the Blessed Sacrament heightens our senses to perceive the Real Presence, the Real Jesus. After receiving Him at Mass, spend time in prayer in His Presence, reflecting on the gift you have received, asking Him to transform your life through the power of the Eucharist. He is waiting for you in the tabernacle, or in the monstrance in Perpetual Adoration chapels or at special times of Eucharistic Adoration. For a non-Catholic who is attracted to the majesty and tradition of the Catholic Church, it is a form of suffering to not be able to receive Communion. Eucharistic Adoration can provide a great source of consolation if you are discerning about or are in the process of converting to Catholicism. In Eucharistic Adoration you can find a quiet and sacred place to pray. And though you are unable to receive the Eucharist , you can make a spiritual communion to unite yourself with our Eucharistic Lord. This is especially meaningful when you are praying in His Real Presence in Adoration of the Blessed Sacrament. The adoration of the Lord in the sacrament is also an education in sensitizing our conscience. ‘Christ comes into the hearts of our brothers and sisters and visits their consciences.’ When the conscience becomes dulled, this lets in the violence that lays waste the world. Anyone who gazes upon the face of the Lord, which the servants of the Sanhedrin and Pilate’s servants have spat upon, which they have slapped and covered with spittle, will see in his face the mirror of our violence, a reflection of what sin is, and their conscience will be purified in the way that is the precondition for every social reform, for every improvement in human affairs. For the reform of human relationships rests in the first place on a reinforcement of moral strength (God is Near Us: The Eucharist, the Heart of Life, p. 98). All you have to do is turn on the news to discover why prayer before Jesus in the Blessed Sacrament is so desperately needed. Pope John Paul II said in a Eucharistic Congress in 1993, “the … surest and the most effective way of establishing peace on the face of the earth is through the great power of Perpetual Adoration of the Blessed Sacrament.” Blessed Mother Teresa of Calcutta said, “If people spent an hour a week in Eucharistic adoration, abortion would be ended.” The power of the Eucharist to change hearts is documented around the world in places where the Eucharist is adored.